On 20th July after several weeks of negotiations between the various political parties and three rounds of unfruitful voting Bamir Topi (Democrat Party PD) became the new President of the Republic of Albania. In a fourth round of voting, the candidate supported by the Prime Minister Sali Berisha (PD) won 85 votes in the Assembly of the Republic of Albania out of the 90 members present. His challenger, Neritan Ceka, president of the opposition party, the Democratic Alliance Party (PADS), won 5 votes. To be elected the President of the Republic had to win at least 3/5ths of the votes of the MPs. Sali Berisha's Democratic Party, which has the majority and has been in power since the general elections on 3rd July 2005 has 78 seats in Parliament, so Bamir Topi owes his election to several MPs from the opposition, notably those from the Socialist Party (PSSH). Sali Berisha welcomed the election of his candidate as Head of State. "The most important thing is that we avoided early general elections," he said. According to the Constitution new general elections have to be organised in the 60 days following the 5th and last round of voting in the presidential election if no candidate has been elected by the MPs. 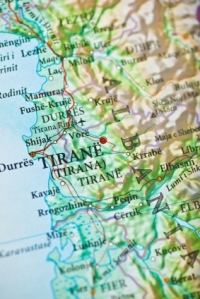 The Prime Minister regularly insisted on the fact that early general elections would be particularly damaging for the future integration of Albania into the EU and NATO, developments he especially hopes for. Bamir Topi has promised to respect the Constitution to maintain the balance of Albanian society as close to EU standards as possible, an entity the country would like to join in the future. Membership of the EU and NATO comprise the two main challenges that Albania has to face according to the new Head of State. "I will be the President of all Albanians, the President of stability, the country's economic development and I shall work for Albania's integration into the EU and NATO," he declared. Bamir Topi thanked Prime Minister Sali Berisha for the support he provided throughout the presidential election. He also thanked the President of Kosovo, Fatmir Sejdiu, who was the first to send him a message of congratulations after the election in which he "perceived an extraordinary sign that both of us want the independence of Kosovo in the interest of peace in the region and more generally, the world." Bamir Topi who is extremely popular in the country trained as a biologist. MP for the Democrat Party he was Agriculture and Foodstuffs Minister from 1996 to 1997 in the government led by Sali Berisha. Before his election, he was leader of his party's parliamentary group. During the first round of voting on 8th July last Bamir Topi won 75 votes, versus 5 only for Fatos Nano, former Socialist Party leader, former Prime Minister (1997-1998, 1998-2002 and 2002-2005) and Sali Berisha's eternal rival. Three days later on 11th July Bamir Topi won 74 votes and Fatos Nano 2. On 14th July the 3rd round brought Bamir Topi against Neritan Ceka and Fatos Nano. The leader of the Democrat Party's parliamentary group won 50 votes versus 32 for his rival and three for Fatos Nano. The main opposition party leader Edi Rama (Socialist Party) and present mayor of the capital Tirana qualified Bamir Topi's election as "a shameful act of corruption". He also said he was sorry that the new Head of State had not been elected as his predecessor; Alfred Spiro Moisiu had been, i.e. based on a consensus. He finally maintained that the socialist MPs who had voted in favour of Bamir Topi of their own free will had in fact abandoned the Socialist Party, which they should quit. The opposition leader tried over several weeks to win the appointment of a consensus candidate and turned Bamir Topi's withdrawal into the condition for the end of the boycott of the presidential election by his party. Edi Rama also qualified the candidature of Neritan Ceka as an attempted diversion and a manoeuvre ultimately to achieve the election of Bamir Topi. The new President of the Republic of Albania elected for a five year mandate will be sworn in on 24th July, the day when his predecessor, Alfred Spiro Moisiu's term in office comes to an end.